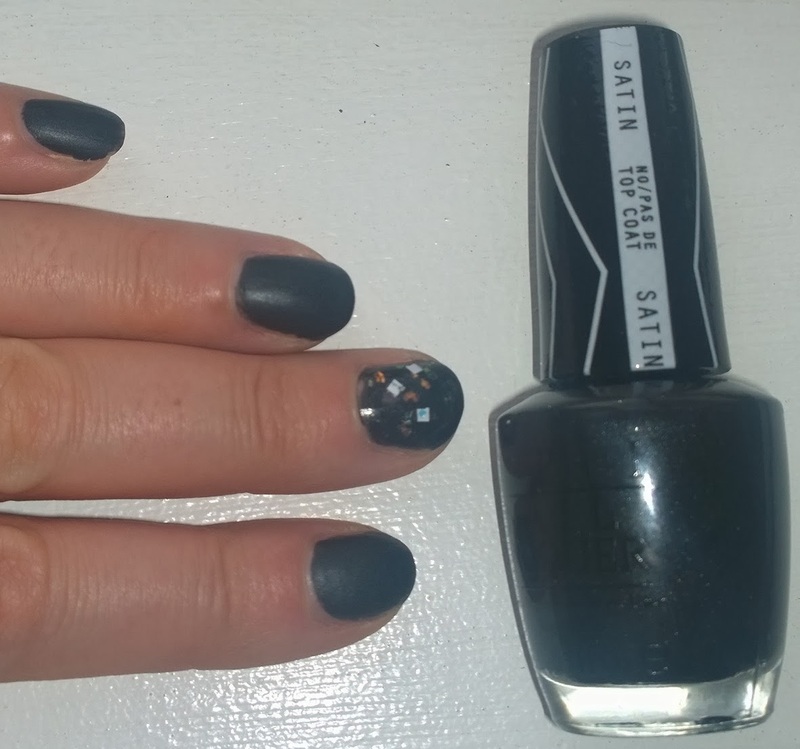 I love darker shades of greys and blacks on my nails and this doesn’t disappoint. It’s pretty monochromatic, it doesn’t really change shade or appearance in different lights (not that I found anyhow) but there is something running through it, not sure what, perhaps a grey’d silver, which helps lift it from looking dead (adding a glossy topcoat actually reveals some of those silver flecks running through it – I won’t call it glitter, as it’s not). Colour-wise, it’s an almost-black/gunmetal grey shade. Two coats will do the trick nicely with this and give you the matte finish on its own. 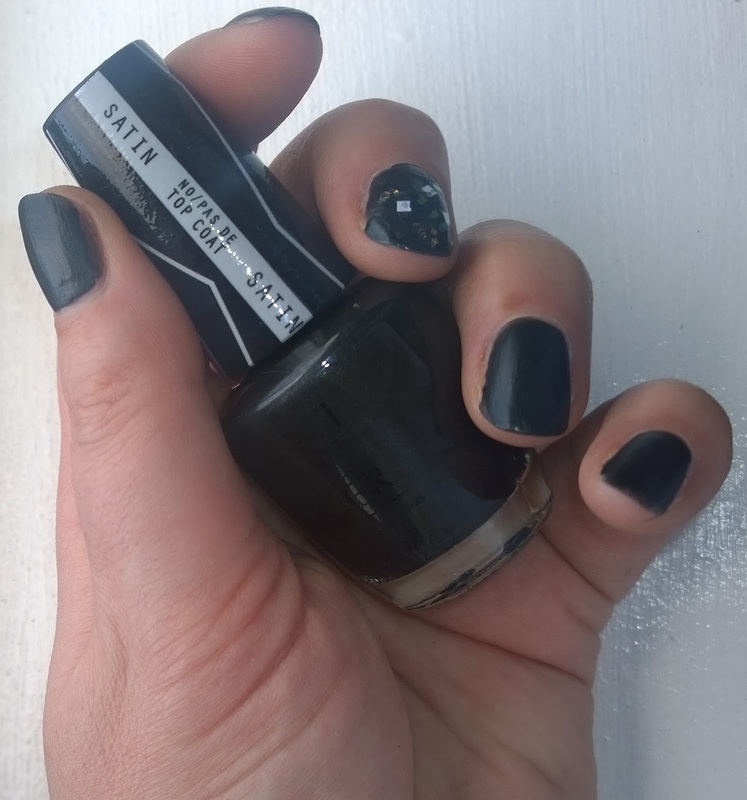 Add a glossy topcoat and you’ll get yourself a reasonable black, but it’s by no means darker-than-the-shades-of-hell black. For that I’ll run to either my Chanel or my Barry M black nailpolish. On my nails below I used an OPI polish on top (Lights of Emerald City, from the Great And Powerful Oz collection) to gloss it up and add some interest via copper and white sparkledybits). In terms of drying time, this one (like most mattes I’ve used) seems to dry reasonably quickly, five minutes and it’s touch-dry, ten and you’re good to go. Wearability-wise, I was impressed with this. It lasted me a full three days with no chipping or dinging, and only on the fourth day, and after washing my hair and cleaning the kitchen, was showing signs of some wear… nail polish barely lasts me two days in general, so I am impressed with this. This was the only one of the collection I managed to get my mitts on, unfortunately the other shades I was interested in were long gone (divine… a chrome silver, a dark, almost blackened winey-blood-red, a satin-finish slightly textured gold, and a holographic glitter… am still sorry I didn’t get hold of ‘em… oh well).